Hoisting and rigging are common features in construction zones where large amounts of materials must be transported up and down scaffolding. 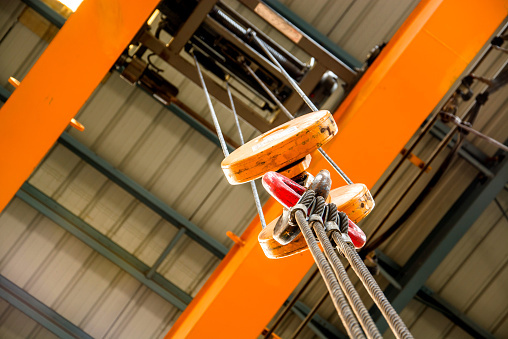 OSHA requires that only qualified and properly trained operators be allowed to work with hoisting and rigging equipment. Furthermore, all hoisting and rigging equipment should be carefully inspected prior to use to ensure the safety of everyone on the jobsite. Construction managers may find it safer to rely on contracted hoisting experts from an outside firm. Continue reading to learn more about hoisting. Slings are commonly used to hoist suspended loads. Wire rope is among the most commonly used materials for slings, as it is capable of withstanding heavy loads and adverse conditions. Some wire ropes feature a fiber core. The outer shell is comprised of individual wires twisted to form strands, which are then twisted together to form the rope. The fiber core gives the wire rope greater flexibility, but lowers its resistance to damage. If greater strength and heat resistance are desired, then it’s best to choose a wire rope with a wire core. Chain slings are ideal because they easily adapt to hold bulky loads and unusually shaped objects. The alloy steel is also strong, but sudden shock can result in damage and potential failure of the sling. Before using a chain sling, the operator should visually inspect it for signs of damage from wear and tear, including gouging, stretching, and nicking. Fiber rope and synthetic web slings aren’t as strong as wire rope or chain slings. However, depending on the specific composition and size, they can still handle loads of up to 300,000 pounds. These slings are primarily used for highly delicate or finished loads. It should be noted that, due to their susceptibility to caustic materials, fiber rope slings shouldn’t be used near acids or other caustics. Could your construction site benefit from the expertise of engineers who are well-versed in hoisting challenges? Contact Scaffold Resource today at (301) 924-7223 to discuss your project. We’re known for providing safe tube and clamp scaffolding in Washington, D.C., but we also offer shoring and hoisting services.